Grego Applegate Edwards Discusses His New Two-Volume Electro-Acoustic Work "Aurora Dreaming"
Greetings to anyone out there reading this. My third and fourth albums are now out, so I thought it might be timely to talk about them a little bit on here, since they are not going to be on the radar I suspect of any of the media channels out there as yet. Plus the objective of course is to attract listeners. So once again I am putting together a little fake interview of self-with-self. Self: So you persist in releasing music CDs in spite of the fact that the market is glutted with indie product? Do you think you are a big deal or something? Grego: No. Not a big deal. Far from it. In fact I am broke, little known and, at this point, my partner and I are living a life of poverty with the road ahead very unclear financially. I am the opposite of a big deal. But after a lifetime of considering music as a composer, player, listener and of course as a writer I do think I have something to contribute. 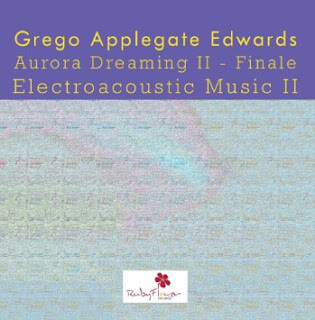 So we have the two-volume electro-acoustic work just now out, Aurora Dreaming, which is available on Ruby Flower Records as Aurora Dreaming I and Aurora Dreaming II: Finale. The idea or root story behind it all is that the mythical Aurora creates the Northern Lights nightly by her special dreaming activities. Aurora Dreaming represents a full night of all that. Self: What made you come up with Aurora Dreaming? Grego: Since my high school days I have been interested in so-called electronic music. I did a good deal of fiddling around with tape recorders when young and it culminated in taking in a lab course at the Columbia-Princeton Electronic Music Center in 1972. Synthesizers were pretty new then. Of course there was by that time a rather sizable volume of works to be heard on record, by the French school of musique concrete with Pierre Schaeffer and his school, the "Americans" Ussachevsky, Babbit, Mimaroglu, then John Cage and his associates, and the Darmstadt folks, Stockhausen most especially, still further the synthesizer-based composers like Rudin, Wuorenin and Subotnik. I listened to and appreciated most all of it, and tried in my own way to get a widely dense and pointillistic scatter of sound. Then later I discovered Reich's early work, Oliveros and the ambiance of Fripp and Eno. By then I had stopped composing for a time. But with the new digital sound modules, synths, digital processing and editing, by the turn of this century, I began getting the elements of a studio together and experimenting with what sounds were possible. That studio is no more for the moment, but the tracks were at a stage where I could process them on PC-based digital editing software and so the later phases of production were done on a comparatively integral and modest set-up. Self: And of course in the meantime "electronics" had become a mainstay of pop, some rock, and hip hop. Grego: Yes. The rock element still interested me but "beats" and such I didn't see myself getting into much. I liked the cosmic expanse that some ambient psychedelia offered, and Fripp and Eno's albums had a big appeal for me. Most of all I liked the quasi-orchestral possibilities that the new digital technology offered. Self: So what does that mean? Grego: Digital technology allows you to layer and fine tune, to "orchestrate" the sound to a much greater degree than when I was back with some elemental analog means at ages 14 to 18. Plus I am not entirely sure back then that I had a coherent vision of what I was after. If something came out sounding right, I went with it. I tried things and they were either interesting or less so. But there wasn't a lot of reworking or editing. partly because I didn't have access to sophisticated equipment for any length of time, plus I was not thinking as conceptually as I might have. Now I can go through composing stages in much greater detail. Plus after years of listening to all kinds of music, I am more focused in what I want to do. So essentially the entire Aurora sequence developed over several years of time. I built up more or less complex layers of sound using synthesizers, very electric guitars, bass, percussion, drums, natural sounds, voice and a tiny bit of sampled things, the latter exclusively on the first couple of movements. Once I had obtained a mix of the various elements, and that in itself was quite involved with many attempts...anyway once I was happy with the various balances I subjected the master mixes to further modifications. Ultimately I was after a highly ambient series of gradually changing sound plateauxs, with sections representing Aurora drifting off to sleep, her first dreams of the night, and then on to some very deep (and sonically dense) late night dreams, climaxing just before the dawn, when Venus (the Morning Star) appears and then the creeping sleep-quiet comes on--in response to the first rays of dawn. Without the digital multi-track platform I never would have been able to tune the sound in the ways that I did. I am happy that the result is dynamic and pretty cosmic, and that the textural aspect is quite colorful, I hope. Self: Well, so maybe folks will find it interesting then? Grego: I hope so! It's more about slowness than speed, more continuous than rapidly scattered, more harmonic than melodic, blocks of density with varying degrees of note clusters laced with noise, not static but except in a few sections not conventionally pulsating. The two volumes taken together represent one evening of Aurora and her sky painting, her slumbers and heaven-embracing dreams. Self: So what kind of music is it? Grego: I don't know except that it has something to do with the electricity of rock, sometimes a bit of the openness of improv, but in all that a sort of continuity of electro-acoustic poetics. There is most definitely some of the immediacy of the highly electric psychedelic ambiance such as I've been exposed to from the days of Hendrix on, yet more long-formed and so having some relation to new-music classical. As I went through the various stages of building up the music I was never exactly sure until towards the last stages where precisely it was going, though there was a general vision. I did not set out to follow any special style-set so much as I went with my intuitions building up, tearing down, rebuilding, transforming until I began to see where it was all headed. Self: Where do you see this fitting in as far as your future music is concerned? Grego: I think it is a pause point for me. Unless there is an opportunity to create thick washes of live instruments playing in real time I think I've taken this sound as far as I would like it to go. Upcoming releases are going to be more pulsating and directional than this. We'll see after I get the rest of this music out what sort of live music possibilities develop. Meanwhile I hope people will go the little extra and get this set, the second volume which is priced at $9 to encourage more folks to take a chance. I hope there will be lots of listeners and that they open themselves up to where the music can take them. There is a real journey there sonically. This is not designed to make me money, but to give people an experience. Self: OK, then. Here is a link to the Amazon site and Volume 2's ordering info. From there it is easy enough to call up the first volume info as well. We last encountered pianist-composer James Adler back in July 3, 2013 with his James Adler and Friends CD (see the post on this site). He returns with another wide-ranging offering called Introspections (Albany TROY 1529). As before James combines his own music in various configurations with that of others he feels affinity with, in which he performs as the pianist: Keith Cummines' "Three Works for James Adler" (2013-14), Paul Turok's "Clarinet Sonata, op. 110" (2011) (with Alexander Fiterstein on clarinet), and Seth Bedford's two movements from "Three Postcards for Piano" (2011-2013). Then there are the Adler compositions: "Suite Moderne for Strings" (1982), "Psalm for Michael" (2003) for piano, oboe (Virginia Brewer) and cello (Eugene Moye, Jr.), "Six Little Variations on Noel Ancien" (1986) for piano and flute (Cain-Oscar Bergeron), "Twisted Tango" (2012) for piano and tenor saxophone (David Babich), and finally the song cycle "3 Introspections" (2014) with tenor Malcolm J. Merriweather, plus oboe (Brewer) and piano. The music is quite decently performed. 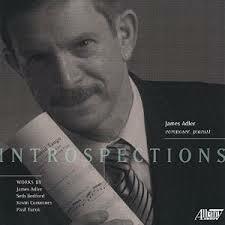 James Adler excels as performer-pianist without necessarily showing a huge amount of virtuosity. These works are not about that. It all hangs together stylistically in the modern neo-classical and post-romantic expressionist style, with an emphasis on the former. The pieces are all well-crafted and bear scrutiny as they give pleasure. I would not put it in the top-ten releases of modern music I've covered thus far this year, but I would suggest that there is much to appreciate in this music. It is worthwhile! Hear it. The sphere of original instrument recordings in classical music continues to expand. I first became aware of such things sometime in the mid-to-later '70s, primarily in the large ensemble realm. It was a revelation. Then solo piano recordings began appearing. I may have missed others at that time, but in the realm of chamber music for mixed instrumentation there seems to have been a special burgeoning in the last several decades. We have been treated to some very fine period-style recordings of Beethoven chamber music lately for example and I have covered many here. 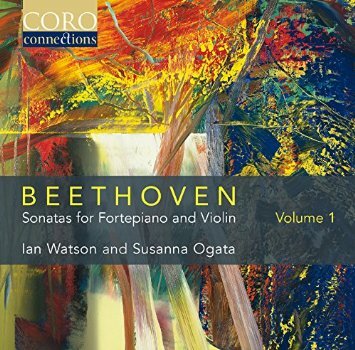 Today another excellent one, Beethoven's Sonatas for Fortepiano and Violin, Volume One (CORO 6138), as played by Ian Watson, piano and Susanna Ogata, violin. The fortepiano used on the CD is contemporary with Beethoven's day and sounds rather glorious. The violin is period as well. With the sonorities and balance there as Beethoven originally conceived of them, we hear something different. Of course the pianoforte of Beethoven's time was more subdued, the volume lower and the registers less inclined to "ring out." The violin subsequently is more prominent in the mix. The result is revelatory, the piano passagework less dominant yet of course luminously present as realized with the sonarities involved. Volume One covers the Sonata No. 4 and Sonata No. 9 "Kreutzer." As the artists state in the liners, the aim is "to recreate the white-hot emotions and passion that these sonatas must have generated in their first performances." That certainly seems to be the case, to my ears. Watson and Ogata give us warm, empassioned readings filled with zest and brio, but given the original instrumentation they do that without the sort of clangorousness one gets with the modern piano especially. These are beautifully alive readings, lacking nothing in virtuoso presence but sounding more articulated and transparent. The original instrument balance is such that you hear each part with a new clarity. I've noticed such things too with the original instrument recordings of Beethoven's Cello Sonatas and Piano Trios (covered here). And original instruments or not, Watson and Ogata give us excellent performances. Add the pristine sound as Beethoven must have conceived it and you have something really fine indeed. I look forward to volume two! Meanwhile this is a highly recommended offering. It brings me joy! The Sixteen's seminal recording project of the choral music of Giovanni Pierluigi da Palestrina (1525-1594) shows no sign of flagging with the release of Volume 6 (Choro 16133). Far from it. Italy's most accomplished and advanced composer of contrapuntal sacred music of his era had a vast output, sufficient to fill many CDs. He wrote more than 100 masses alone! 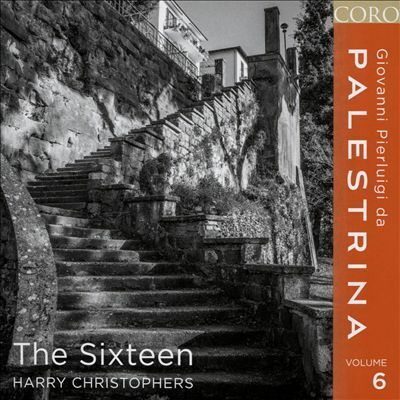 The "Volume 6" continues the Sixteen and Harry Christophers' masterful survey. On the program this time out is the "Missa L'Homme Arme," a substantial work on a theme that in the day was quite popular. Palestrina did two settings of it and this one is very fine indeed! We also get his "Song of Songs" nos. 16-18 and a brace of shorter single-movement works. They show Palestrina once again as the master he was. And as we have come to expect, Christophers and the Sixteen give us pristine, fresh, glowing performances that reach back through the ages with great understanding and sympathy, and create versions that speak to us volumes. Perhaps the only question might be, exactly how many volumes of Palestrina do you need? That of course depends on the depth of your collection, but for me there is no question that all six volumes are essential each in its own way, that with the Sixteen and Christophers involved six volumes are not at all too many. The music is too beautifully done here. Were the Sixteen to continue on to ten or more volumes I would feel the same way. At any rate you can get a copy of Volume 6 with no fear that there is anything wanting. Even on its own this is one ravishing disk! The shimmering glow of the vibrato-less choir articulating fully the beautiful part writing is exceptionally moving! New solo cathedral organ music in the grand tradition? 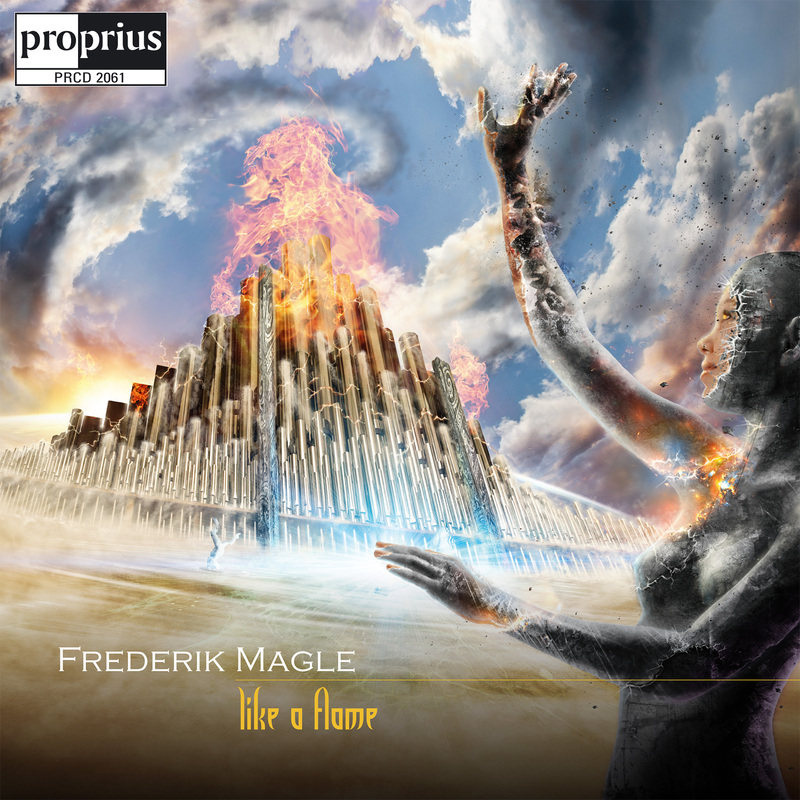 Frederik Magle's Like A Flame (Proprius 2061 2-CD) is very much that. He improvised some 60 works in a marathon session over two days. 23 works were selected out of that for this recording. These were sufficiently and outstandingly inventive such that Magle transcribed them all so that others too might perform them. Good idea. He is playing the brand new Frobenius organ in Jorlunde church, Denmark, an instrument he was responsible for designing sonically. It sounds quite beautiful. This is music that is modernly tonal and reaches back to the symphonic organ work of the French school, Tournemire et al., but has the Magle touch and brilliance throughout. He is young and very able. The music jumps out of the speakers with contrasts of intensity and quietude, some remarkable improvisations that have a multi-dimensional depth one expects of such music. Yet this is in no way generic but sonically present continuously as original and sweepingly expressive. I like the music all the more as I have listened all the more often. It is a remarkable achievement. All organ afficionados will find this much to their liking, I do believe. The thematic unity in the album at hand today has to do with using Norwegian folk songs as a basis for new music compositions for piano and electronics. Pianist Ingfrid Breie Nyhus thoughtfully and thoroughly takes on three works for a programmatic CD entitled Abstraction in Folk Art (LabLabel LAB002). 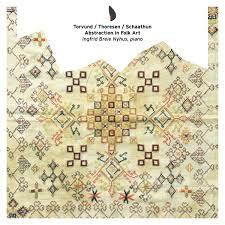 The works at hand: Oyvind Torvund, "Abstraction in Folk Art" for piano, electronics and cassette players (2014), Lasse Thoresen, "Solspill" for piano (1983), and Asbjorn Schaathun, "Nations" for piano and live electronics (2014). All of the music partakes in transformed, reworked folk phrasings and tonality, broken out of rigid musical straightjackets to breathe freely as abstractions of the new music sort. Ms. Nyhus focuses on the all-important flow of the phrases to reveal to us the sometimes jagged, sometimes torrential, always reshaped structures of pianism in partnership at times with electronic transformations. What seems especially interesting to me is that the music generally deconstructs its folk material so that we get something wholly other, wholly new-music oriented. In an analogy with visual arts, these aren't cubistic reframings of recognizable objects so much as abstract expressionist reformulations of form and color that share something of the essence of folk modes but transform them into somewhat unrecognizable all-over, irregular patternings. That I hope is helpful as an analogy. In any event Ms. Nyhus gives us a very pianistic take on the music. All three works share a re-representationalist outlook, which gives the program a very special unity-in-identity. It is some rather wonderful music, fantasia-like yet airborn by a musical wind that drives the sonic elements forward in an ordered regrouping. I find the music both rather ultra-modern yet no doubt quite readily accessible to any serious listener. Bravo Ingfrid Breie Nyhus! Bravo composers! Arthur Honegger, 20th-Century master modernist, seems to get less attention out there in the recent present than he did earlier on. Sure, some works still form a cornerstone of the repertoire but much else in his pretty vast output has been subject to benign neglect, relatively speaking. Often enough the vocal works don't get the attention they deserve, mostly. Jeanne d'Arc au Bucher (Alpha 709) is a good example. I know there have been a number of previous recordings, not many of late, and in fact I have never heard the work up until now. The recording at hand offers a very respectable, even quite good performance. Marc Soustrat conducts the Barcelona Symphony & Catalona National Orchestra with various amassed choirs and Marion Cotillard & Xavier Gallais as the principal soloists. The libretto was written by Paul Claudel. It received its first performance in 1938 in concert version, the staged version would have to wait until 1942. The prologue was written later on, in 1944. It is followed by eleven scenes. The present recording takes up 75 minutes. There are some dialog segments, some quasi-sprechstimme with orchestra and choral background, necessary for the narrative but sometimes less interesting as music. The whole is vintage Honegger, moody and dramatic. It is not rabidly modernistic, but extends a tonality outwards in Honegger's brilliant way. It took me a number of listens to get into the music but I eventually did. It may not be the end-all of Honegger vocal works. There are others of course, some really seminal. 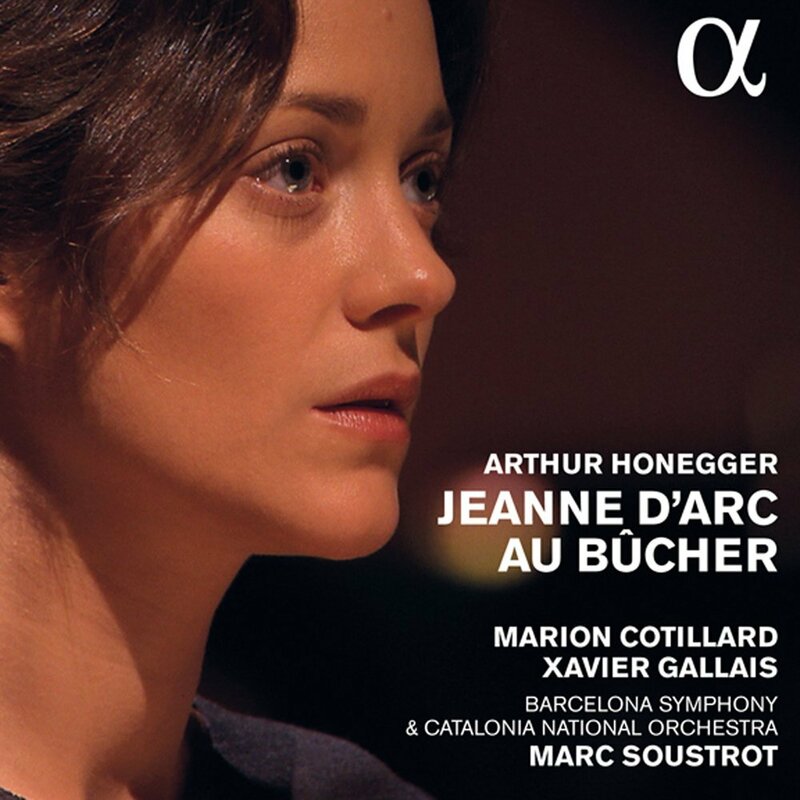 Jeanne d'Arc may not be Honegger at a masterpiece level but it is very effective, even haunting at times. Soustrat, the Barcelona orchestra, the choral forces and the soloists capture the moodiness of the work quite well. There may be better versions from the old days but I have not heard them. Anyone who reveres Honegger will find this release essential. I for one am glad it exists. If you are a full-bore 20th century classicist you will want this one. 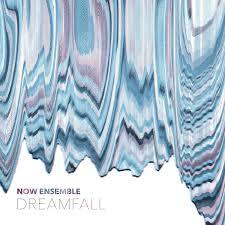 The contemporary chamber Now Ensemble shows us a novel way through the thicket with new music in a radical tonality, post-minimalist zone on their album Dreamfall (New Amsterdam 064). Their close-knit ensemble sound thrives through a careful selection of new repertoire that comes from the ensemble itself as well as stylistically compatible works from associates not directly associated, and from the dexterous affinity of each ensemble member with the whole. The ensemble has a core group of instrumentalists: Sara Budde on clarinet, Logan Coale on contrabass, Mark Dancigers on electric guitar (who wrote the title track "Dreamfall I, II, III"), Michael Misrahi on piano and Alex Sopp on flute. There are several others who are a part of the group as composers only, Patrick Burke and Judd Greenstein, the latter of whom contributes for the album the work "City Boy." There is some electronic manipulation to be heard here and there, to add to the ambiance of the music on occasion. And ultimately a kind of polar drift takes place on the album between ambient soundscapes and more dynamic linear forms. The combination of Dancigers's electric guitar with electronic enhancements and traditional classical chamber instruments gives the composers involved a kind of ultra-contemporary template for ambitious sound sculpting. The musical excellence of the ensemble and their strong affinity to the works leads to some marvelously spacious results. In addition to the previously mentioned Greenstein and Dancigers works there are another five relatively short pieces by Scott Smallwood, John Supko, Nathan Williamson, Sarah Kirkland Snider and Andrea Mazzariello. Each has its own distinct identity; each operates and engages fully thanks to the ensemble's obvious relish of the music, their carefully established identity as players of post-, anything goes music within a relatively unified universe of new sounds. The Now Ensemble and the compositions represented give us a kind of torqued oscillation between space and thrust, heft and feather-lightness, the subtle and the bold, the lyric and the powerful. It is new music with the experience of all that went before harnessed to what is "now" and, perhaps, what is still to come. I found the entire program very uplifting, very capable of giving the listener sounds that have a vivid, ever increasing memorability after repeated close listens. 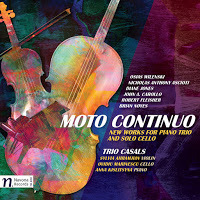 The formidable Trio Casals give us Moto Continuo: New Works for Piano Trio and Solo Cello (Navona 6003), a series of six worthy pieces in modernist and neo-classic zones. There is Robert Fleisher's solo cello piece "Ma Mere," based on Debussy, well played by Ovodiu Marinescu. The rest are piano trios with some very lively modernity. John A. Carollo's "Piano Trio No. 1" has some excellent advanced, integral part writing that stays in the mind and fills us in on his latest chamber music. We hear contemporary neo-classic music of great interest in Diane Jones' "Three Songs." We get some serious contrapuntal writing on Osias Wilenski's "Variations for Trio" and Nicholas Anthony Asciotti's "Adirondack Tableau." Brian Noyes' "Piano Trio Op. 38" concludes the program with a moody, compelling work that has an almost orchestral fullness to it. Trio Casals makes it all come alive with genuine artistry and superb interpretive skills. Moto Continuo is a winner on all fronts. It should be heard by anyone interested in experiencing some of the latest superior chamber music from the modern zone. Encore! Saint-Exupery was a French writer, poet and pioneering aviator. His novel masterpiece The Little Prince appeared in 1943 at the same time as he was serving as a pilot in the French Air Squadron in North Africa. He flew on a mission over Occupied France and never returned, presumed dead. 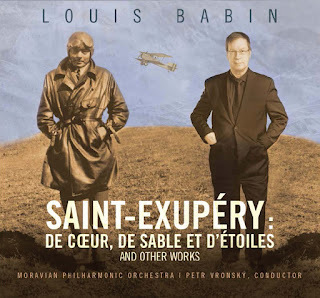 Saint-Exupery: De Coeur, De Sable et D'Etoiles and Other Works (Les Productions Louis Babin ODL-LB-002) is Canadian composer Louis Babin's tribute to the life and work of Saint-Exupery. It features the centerpiece "Saint-Exupery: de coeuer, de sable et d'etoiles" along with "Couleurs" and "Le Suite du promeneur," all orchestral works performed quite respectably by the Moravian Philharmonic under Petr Vronsky. These are descriptively modern tonal pieces that cover some considerable terrain with a post-romantic sensibility and a varied palette of orchestral colors. There is much to appreciate, vivid music from a Canadian composer who is perhaps not as well known outside his home country as he deserves. 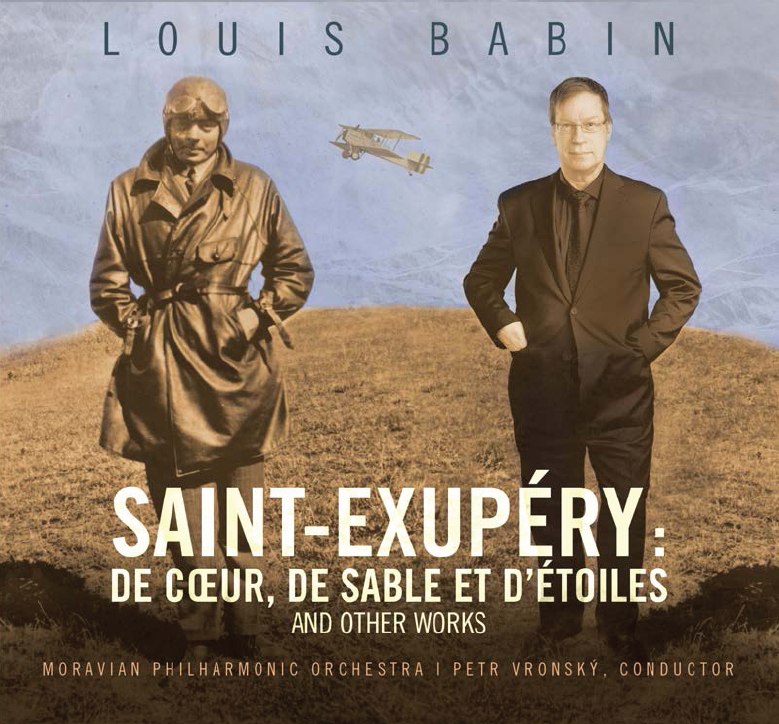 Saint-Exupery gives us three exemplary works that serve as a good introduction to Louis Babin. Listen and enjoy. Russian composer Alfred Schnittke (1934-1998) was extraordinarily accomplished, increasing polystylistic, and unpredictable. He left behind him a body of works that have still not been fully explored in new music circles and among serious listeners. Many will know that he found employment composing film soundtracks, for example, but few in the world at large have had the chance to familiarize themselves with any of them. The opportunity for that is very much here in the comprehensive four-CD set Film Music Edition (Capriccio C7196), with orchestral suites based on soundtracks for ten films, performed well by the Rundfunk Sinfonieorchester Berlin under Frank Strobel. It is treasure trove of orchestral music occupying a stylistic universe so diverse as to surprise often and nicely. We hear everything from neo-classical to rock-influenced to neo-romantic, ultra-modern and contemporary anthemic (i.e., memorable yet tied to the mood of a film). There is so much worthy music to absorb on these four CDs that I still have some ways to go to a full assimilation of it all. I need more time which I will gladly give this music in the weeks to come. The box set gives you a Schnittke both fully original yet harnessed to the particular needs of any given film. To his credit the music is never perfunctory. There is consistency in the realization of high standards of craft and inspiration. It shows the creative brilliance of the composer while it no doubt furnishes highly effective music to fit each film. If you do not know Schittke as yet, you should. This is not the place to start, however, unless you want to approach his music from the outside in. His quartets and symphonies otherwise would be the best place to begin. Nevertheless this is music to complete the picture of Schnittke as composer-in-the-world. It is invariably fascinating music, a revelation to all who think they know Schittke fully. Very recommended! John Potter, the tenor of the now defunct but well-acclaimed Hilliard Ensemble, steps out with a winning solo effort, Amores Pasados (ECM 2441 B0023445-02). For the album John had the great idea of looking at the divide between art song and popular song, a modern development, by performing folk-oriented songs by composers from early times to the present and by performing art songs by three rock songwriters, John Paul Jones (Led Zeppelin), Tony Banks (keyboardist from Genesis) and Sting. So we get a very varied cornucopia of song, performed in early music folkish style by John Potter, Anna Maria Friman on vocals and hardanger fiddle, with Ariel Abramovich and Jacob Heringman on lutes. What amazes is how all the songs from such diverse times and places work together in a program where the present and the past commingle together artfully, glowingly. In addition to those by the rock songsters we get songs by Lope de Vega (1562-1613), Gustavo Adolfo Becquer (1836-1870), John Fletcher (1579-1625), Peter Warlock (1884-1930), Thomas Campion (1567-1620). A. E. Housman (1859-1930) and E. J. Moeran (1894-1950). All flows beautifully together with Potter's vocals and those of Ms. Friman standing out with sensitive artfulness, the lute and fiddle parts giving us an early music feel yet of course the melodic structures differing by period. Nevertheless one finds the music unified by the instrumentation and vocal presence, as if one were looking into the future from the perspective of a Renaissance performing troupe. It all is rather uncanny. Potter is outstanding as are the others in creating and sustaining a timeless mood, somehow mysteriously partaking of ages long gone and of the very near present. The sound has that ECM touch, so fitting for this music, and the performances are in every way worthy of the songs and their consistently high quality. 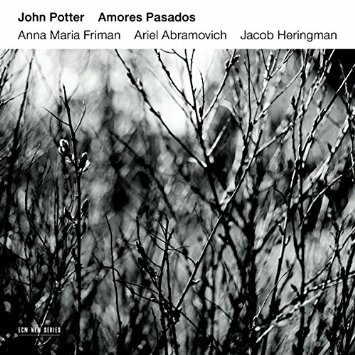 Given half a chance, John Potter and ensemble will put you under their spell and give you much pleasure with this fine album. If we forget about Mahler and Bruckner for a moment, who at any rate achieved fame primarily in a posthumous context, Richard Strauss and Richard Wagner were the towering Late Romantic figures in their lifetimes and beyond, achieving iconic status for their operas, their treatment of the orchestra and their original approach. Strauss in many ways was an unprecedented extension of Wagner, so grouping the two together is not at all a stretch. And both wrote lieder, Strauss especially. Consequently when an excellent Canadian soprano treats us to a program featuring the two, on Adrianne Pieczonka Sings Strauss & Wagner (Delos 3474), we are on firm ground with a landscape that complements itself in its details and overall landmarks. Strauss was a great Wagner enthusiast in his formative years and in many ways worked his way through that strong influence to his own path. In the realm of lieder Strauss excelled. Wagner did not produce much in the way of songs, but the "Wesendonk-Lieder" was a notable exception. He was involved in an affair with Mathilde Wesendonk in 1857, whose poetry furnished Wagner with lyrics for the five songs of the cycle. Two of the lieder ended up providing musical themes for his opera Tristan und Isolde. We hear the original version of the "Wesendonk-Lieder" for this recording, scored for vocal and piano. Wagner later orchestrated one and others reworked the other four. In its primary version Adrianne Pieczonka and pianist Brian Zeger give us an intimate reading that goes quite well with the Strauss lieder while also showcasing her considerable talent. Richard Strauss was far more prolific a lieder composer. His output continues to form a staple in 20th century repertoire and rightfully so. We get 12 of them on this program, with Brian Zeger again on the piano. In all Strauss wrote some 158 songs, mostly at the beginning and end of his composing life. We get a nice selection of the early ones, such as "Rote Rosen," only discovered in 1958, and a good sampling of the late songs. Zeger is the ideal accompanist, in total synch with the vocal lead, unobtrusive yet pianistically strong. Adrianne Pieczonka, her ravishing tone, her powerful projective dramatic sense, her impeccable musicality, is the near-ideal artist for this repertoire. If she reminds me favorably of the great Kirsten Flagstad, it is for those qualities Kisten embodied so beautifully--strength in all ranges and an artful dramatic sense. Adrianne Pieczonka impresses me as one of the great living exponents of this repertoire, based on the CD at hand. For that reason I most certainly recommend this album. Ravishing lieder, ravishing performances! Terry Riley catapulted into new music fame with the release of the first recording of his "In C" back in the later '60s. It is regarded today as a landmark in the development of so-called minimalism. He went on to other works and other recordings that continued his explorations into the mesmeric mantras of repetition. But there is another side to the composer, in his later years especially, that goes beyond that style and into a considered tonality generally more through-composed, less cyclical, more open and exploratory yet original and recognizably Riley-like. 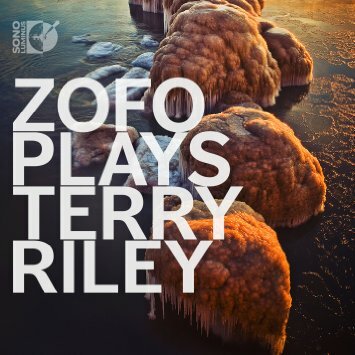 The very capable, very expressively pianistic and adventuresome four-hand piano duo ZOFO (Eva-Maria Zimmermann and Keisuke Nakagoshi) give us nine such works on their recent ZOFO Plays Terry Riley (Sono Luminus 92189), which as with many Sono Luminus releases comes as a standard two-channel CD and a blueray DVD 5:1 mix as a part of the release package. The only composition I am familiar with is "G Song," which was recorded some years ago in a chamber version. It sounds quite well for 4-handed piano. The other eight pieces were previously unfamiliar to me. "Praying Mantis Rag" was specially commissioned by ZOFO. The entire program presents a very different side of Riley, the music well-suited for the four-hand sensibilities of ZOFO, fascinating pieces that gives us Riley the post-cosmopolitan, world-directed classicist. It is a triumph for ZOFO and a great program in itself. This is a different Terry Riley than we may expect but nevertheless excellent in all senses. Listen! The Ancient Greeks originally thought that the morning star (Phosphorus) and the evening star (Hesperus) were two different entities. The Babylonians apparently knew they were one and the same. At some point the Greeks confirmed that the Babylonians were correct. They both are actually Venus, which we know to be the case these days. 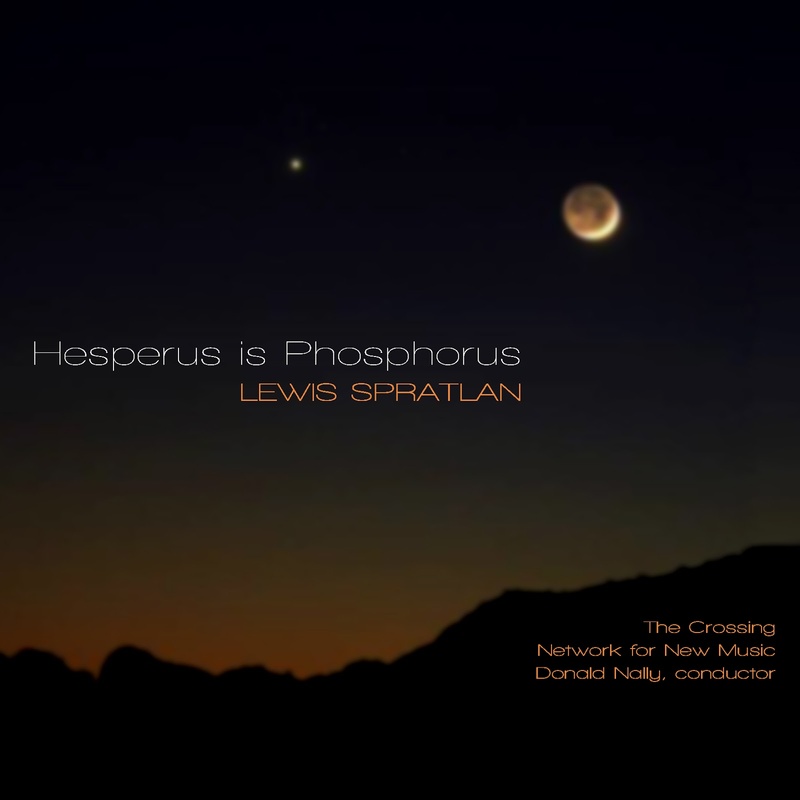 The discovery of the sameness in difference has a sort of human enlightenment dimension that composer Lewis Spratlan has turned into a major choral-chamber ensemble work with texts from such diverse sources as Adrienne Rich, Richard Feynman and the Magnificat. The work is long and ambitious, lasting nearly 70 minutes. It conjoins the chamber Network for New Music Ensemble under Jan Krzywicki with the choral group The Crossing, conducted by Donald Nally. Vespers Cantata: Hesperus is Phosphorus (Innova 894) enables us to hear the full work in all its sonic liveliness. A summary of the piece does not come easily. It is a sprawling, dramatically vivid cantata that comes to terms with belief and reality, cosmic appearance and human interpretation, spirituality and change. The music is modern with tonality predominate, but it does not fit comfortably into some categorical niche. It certainly partakes of choral tradition but within Spratlan's own particular vision. The performance leaves nothing to be desired. It is all one might hope for in a first recording, sympathetic and dynamic. Spratlan shows us inspired form, craftsmanship and his own brand of expressive brilliance. This is one of those contemporary works that may well find its way into the repertoire. It deserves a place. Hear it and decide for yourself. Bravo! 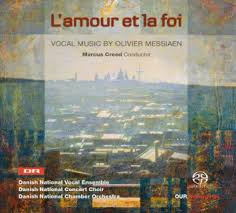 L'amour et la Foi, Vocal Music by Olivier Messiaen, Danish National Vocal Ensemble, etc. Olivier Messiaen (1908-1992) wrote so much worthwhile music in his lifetime that most, if not all of us are still catching up. The early choral music was for me an unknown quantity until now, until this spirited performance of three real gems has come my way. The Danish National Vocal Ensemble, the Danish National Concert Choir and the Danish National Chamber Orchestra gives us L'amour et la foi (OUR Recordings 6.220612). Marcus Creed conducts. The three works were completed in 1937, 1943 and 1948. This was a period of great rhythmic vitality for Olivier, a period where his originality shines forth brightly for the first time, a period where his own version of tonality was spiced with modernisms of an advanced harmonic vision, the period of the "Turangalila Symphony." "Trois petites liturgies de la Presence devine" the brief "O sacrum convivium!" and "Cinq Rechants" have all the markings of the masterful early incarnation of Messiaen, including piano (Marianna Shirlinyan), ondes Martinot (Thomas Bloch) and a lively part for chamber orchestra. All that for the "Trois petit liturges." The other two works are a capella, "Cinq Rechants" for a large group of 72 voices. The choral parts, then, are much the focus of the music. The Danish National vocal groups are most certainly attuned to the spirit of the scores, giving us the etherial beauty without fail. The orchestra and soloists too, are exemplary. Marcus Creed knows what he is after and the disk shines luminously thanks to his vision and the talent of the performers. "Le Petit" is a neglected masterpiece of the period but the two other works have much magic as well. You may have heard these works elsewhere but they sound so well here that you may forget the other versions. All Messiaen lovers will be transported. If you don't know his early music that well, not to worry. This is a great starting point. The album gives me joy. I imagine it will do the same for you. The singular beauty of Franz Schubert's solo piano music hit me dramatically sometime around age 18. It changed my idea of what could be said musically without an overemphasis on pyrotechnics or high drama. It was a music without pretensions. Long unfolding and enfolding melodic-harmonic brilliance without end, music so lyrically strong it spoke directly through the ages to your inmost musical being. I never went back. Schubert has been a part of me ever since. 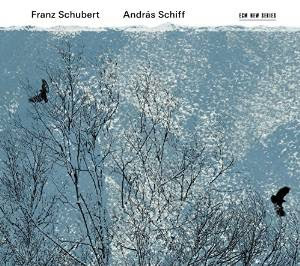 So even though I have had some favorite performances of most all the Schubert solo works (mostly on vinyl), I was pleased to receive a new two-CD set of gems by the remarkable modern pianist Andras Schiff. The set is simply called Franz Schubert (ECM New Series 2425/26 4811572). The first thing you notice: this is Schubert in vivid period performance, played on a very sonically alive Franz Brodman fortepiano manufactured in Vienna around 1820. I have never had trouble with the best readings of Schubert on a modern instrument, but nonetheless the piano featured here is more in line with the balance of timbres and dynamics as Schubert himself experienced them, not to mention the intimate friends-listeners in a Schubertiade evening. Add to that Schiff's careful selection of some of the most brilliantly unpretentious works for performance. The glorious "Moments musicaux, op. 17," the Sonatas D894 and D960, the "Vier Impromptus D93," etc. These are some of the finest of the Schubert piano works, not necessarily the most overtly difficult to play on the surface, but those that demand an artist's poetic touch, lyrical, unendingly melodic masterpieces. Schiff most certainly is a pianist who totally immerses himself in the magic of this music. He is not out to impress with showmanship, but rather to get deeply inside the music and the subtlety of phrasing. He does that so well here. And the sound of the 1820 Brodman is a revelation. Each register has its own special sound, which is typical of the early pianos, so that the colors of the music and the original balance in passagework comes through strikingly, thanks of course to Maestro Schiff's careful attention to the phrasing as it sounds on the old instruments. The result is a set of interpretations that brings out even more strongly the melodic beauty of the music. The parts are transparently singular, which a great period piano performance by a master allows you to hear as never before. The modern piano versions can be wonderful, of course, but you do get a different balance, as registers that tend to ring out more sonorously may take a larger sonic space than Schubert intended. Schiff allows you to hear the music all over again. It takes someone of the extraordinary musical caliber of Andras Schiff to make it work in the highest poetic way. He does it throughout the set. It is marvelous Schubert to begin with. And Schiff makes it all the more stunning. If you don't have much Schubert piano music, here is a place to start. If you have been all over Schubert's music, here is a place to return to and hear the music in a new revelatory light. Fabulous! The thematic program can create a long-lived mood that perhaps no one work can do as well. That assumes that the music is well chosen and works together to bring to the theme a multi-faceted musical landscape. 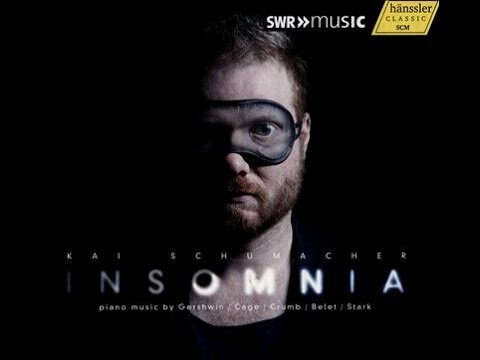 That surely is the case with pianist Kai Schumacher and his suite of modern works all having something to do with Insomnia (Hanssler Classic 93-334). The album covers five pieces in multiple modern dimensions, showcasing the solo pianistic gamut of possibilities and a wide historical time frame. The sequence is well considered and gives us an aural workout on the themes of night, sleep and the lack of it. So we begin with George Gershwin's little gem "Sleepless Night (Prelude)" played on a slightly out-of-tune saloon piano to give us that "last call" atmospheric feel. From there we go to John Cage's mesmeric "Dream" and its magic. Perhaps the centerpiece is the George Crumb opus, "A Little Midnight Music," his inside-and-outside the piano meditations on Thelonious Monk's "Round Midnight." It is especially well done, though Schumacher treats all the works with special attention to sound staging and a dramatic sensitivity to mood. Brian Belet's "Summer Phantoms: Nocturne" delves even more deeply into the evocative inside-outside the piano night ruminations, with electronics joined closely with the live piano part to create a deep-night atmosphere. We end with Bruce Stark's more down-to-earth "Urban Nocturnes," in a sense coming full-circle from the immediacy of Gershwin to the more atmospheric night sounds of the three middle pieces and then back again to a matter-of-fact suchness. Kai Schumacher gives us performances of both subtlety and power, making each work stand out as very much within its own world, thanks to the creative interpretive touch of his masterful approach. The album breathes life into the night-sleepless theme in ways that strike the careful listener, map out a dramatic trajectory, stay in the mind as a landmark program that exposes us to a wide range of modern piano music and makes it all accessible by nature of the thematic unity of the program. An impressive outing and a joy of poetic pianism. Bravo, Maestro Schumacher! 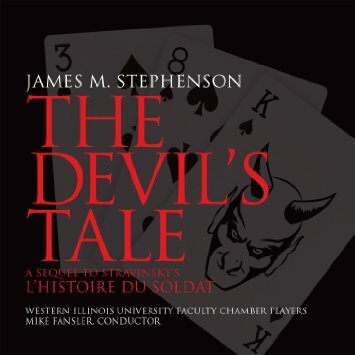 Something today rather unusual, a kind of sequel to Stravinsky's chamber-and-narrative classic "L'Histoire du Soldat," namely James M. Stephenson and his The Devil's Tale (Ravello 7906). It essentially gives us Stravinsky's "Soldat" in reverse, as far as plot goes. There is no fiddle, instead the main character is a musician in a Las Vegas show band, his girlfriend a Vegas dancer, the devil a blackjack dealer. We get a plot where the devil loses, in a kind of symmetrical reversal of the Stravinsky. I've said my peace about works with extensive non-sung narratives. I generally dislike the approach. Here the dialog tells the story effectively enough. Narrator Matt Bean is called upon to play all three characters. He is no Laurence Olivier doing "Hamlet," but let me just bracket all that. It is fundamental to a reverse "Soldat" and so it is there. But it is not the strength of the work. What captures my fancy about the piece is the music. Stephenson manages to convey the period essence, the early Jazz-ish strains of the Stravinsky, the neo-classic elegance and brilliance of the original piece, and make a modern-day analogue that fascinates and enthralls. The seven-member Western Illinois University Faculty Chamber Players under Mike Fansler do an excellent job realizing the score. Stephenson not only understands the essence of the Stravinsky, he recaptures it and creates a vivid rejoiner. If the music reminds a bit of period Weill as well, so much the better. The rhymed narrative-play has of course an essential role in the totality. I have followed along in my listens and must say it is quite adequate, though again perhaps a Laurence Olivier would put it all together in a more convincing way. But the music is quite nice and well performed. So we get a good idea of Stephenson's gestalt. And the music triumphs! If you love "L'Histoire du Soldat" this will give you pleasure. Even without knowing the original there is much to please. Something different! When I was a graduate student years ago it was finals week when must of us were up all night trying to get the papers written for the deadlines. One of my fellow students, who happened to be Amish, remarked the next day how he liked to listen to Haydn Quartets when writing, but only the slow movements. He wished there was a compilation of such things. I thought the idea fascinating, but left it at that and promptly stopped thinking about it. 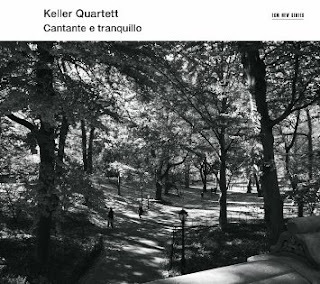 Though nothing like that to my knowledge has come out, we do have the Keller Quartet doing a wider range of quiet movements on the recent Cantante e tranquillo (ECM New Series 2324 B0021591-02). The performances and the selections stand out in a program that puts you in a profoundly tranquil frame of mind, reflective, inward. The late Beethoven Quartets are here in slow movements from Quartets Nos. 16 and 13, we have string quartet arrangements of segments of Bach's "The Art of the Fugue," and then we have a number of modern works, a movement from Alfred Schnittke's "Piano Quintet," and excerpts from works by Ligeti, Kurtag, and Alexander Knaifel. Not all are quartets (there are also duos, trios, quintets) but all are deeply probing, meditative, absorbing, moody in the best ways. The Keller Quartet has an exquisite sensitivity towards the music. That and the quality of the works make us take pause, listen, drift along with it all. It is an extraordinary program and I cannot recommend it strongly enough for when you are in a mood for reflection. The premise behind the Bang On A Can All-Stars album Field Recording (Cantaloupe CD & DVD) was simple. Each composer commissioned for the project was asked to select a pre-existing recording or create one anew and utilize it as a sort of found object to compose music around. 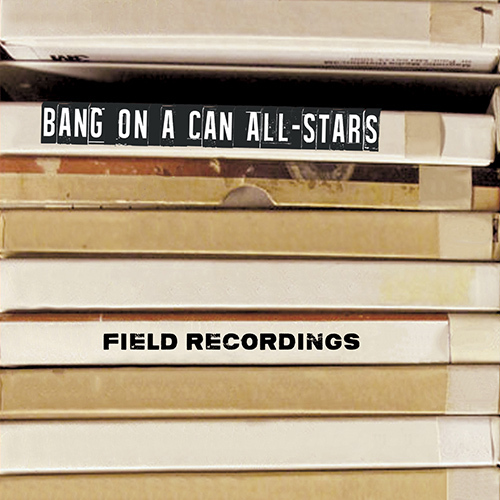 The original tape and its permutations are played back and performed against by the Bang on a Can chamber ensemble according to the respective score the composer created. The premises are simple but the music is far-ranging and very inventive. Source sounds vary widely, from traditional Irish folk singing to street singing, from John Cage reading from his diaries to gospel preaching, electro-acoustic sounds and much else as well. Each in its own way is a gem. So we get works by Julia Wolfe, Florent Ghys, Michael Gordon, Christian Marclay, David Lang, Tyondal Braxton, Johann Johannsson, Todd Reynolds, Steve Reich, Bryce Dessner, Mira Calix and Anna Clyne. The music draws from modern and postmodern, quasi-rock and folk modes with the panache and elan you expect from Bang On A Can adventures. A good deal of funding from listeners and institutions went into making this project a reality, and a good thing it is. There is an accompanying DVD with several of the compositions and visual elements. I was not able to watch it but I imagine it enhances the package. Either way this is music of differences, inspired and played with grace and thrust by the All Stars. There are composers out there today who get your attention ever so gradually over a period of time. Through the accident of place and convergence you only come to appreciate their stature after an ongoing period of exposure. 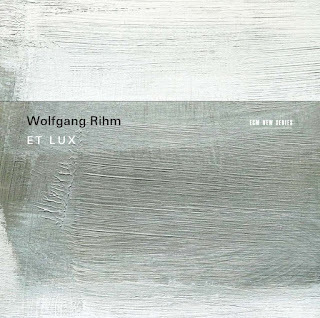 Such a composer for me has been Wolfgang Rihm (b. 1952). I've listened to and appreciated selected works but now with the release of Et Lux (ECM New Series 2404 4811585) I am fully illuminated. The 2009 work is for vocal quartet (Huelgas Ensemble) and string quartet (Minguet Quartet) under the direction of Paul Van Nevel. The sung text consists of fragmented excerpts of the traditional Roman Requiem. The string quartet plays pianissimo, with mutes, the upper-ranged instruments bowed close to the fingerboard to create the sound of an ancient consort of viols. The vocal parts combine early music styles with ultra-modern harmonic densities. The strings similarly give way at times to eruptions of the very contemporary both with and against the vocal group. The hour-long work is a masterfully original example of the early-in-the-late aspect of contemporary music, not following Arvo Part in sound and substance, but creating a mysteriously engaging parallel soundscape that reflects Rihm's own sensibilities. Rihm makes use of old church harmonic part writing as well as the fully dissonant and open possibilities of the modernism we still find central to the world we live in today. The result is a music of remembrance and a sort of confrontation of the weight of our cultural heritage with the real totalities of the present. In the end we are treated to a haunting work that brings us squarely to Rihm's brilliance. The performance is everything one would hope it to be. The recording has the ECM resonance one expects, which seems especially right for a work of this sort. Thrilling music! This one is a must for those who follow the trends in new music and an enthralling listening experience as well. Wolfgang Rihm enchants our ears with a masterpiece. Spring may be over here where I sit at my desk outside New York City. But the music of Emily Doolittle, specifically her album All Spring (Composers Concordance 0025) transcends season. 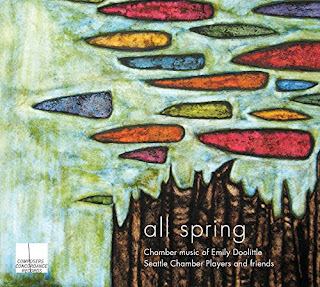 Five works in the chamber mode get careful and effective performance by the Seattle Chamber Players and Friends. I read on the press sheet that the album has an official street date of July 31st, 2015, so I am a bit early. Nonetheless this is music worth waiting for, a set of works that all have a disarming charm, an organic, almost rustic sort of modern feel. She hails originally from Nova Scotia but now divides her time between Seattle and Glasgow. Her music has been performed to acclaim over North America and England. All five works have the personal Doolittle stamp upon them. The music often has a whimsical quality, well paced, organically modern tonal, spun out with a cohesively inventive narrative sequentiality. Each work has a distinct identity. The 2004 "All Spring" song cycle based on the poetry of Rae Crossman has an open poeticism which soprano Maria Mannisto brings out nicely. The duo "Col" (2002/2014) for marimba and violin has a diatonic matter-of-factness and charm. "Why the Parrot Repeats Human Words" (2005) is a narrative based on a Thai folktale with chamber accompaniment. Though I generally do not respond to extensive narrative works I found the chamber music surrounding it compelling. "Four Songs About Water" (2000) portrays water in four different states with corresponding descriptive music for a nine-member chamber ensemble. So we get effectively contrasting movements depicting "Running Water," "Salt Water," "Frozen Water" and "Rain Water." It is fascinating, nicely crafted and innovative. "Falling Still" (2001/2009) has as its inspiration the song of a blackbird singing in the early morning rain. The music has a gentle pastoral quality, lyrical and flowing. If you were to try and pin the ancestry of this music to the influence of forebears you might as I did think of the chamber neo-classic phase of Igor Stravinsky, but that mostly in the pacing, not the tones themselves. Nonetheless Emily Doolittle stands on her own ground, rather delightfully so.